Head coach Gene Hill’s coaching tenure is off to a good start after the Panthers defeated the UNCG Spartans 70-63 in the women’s basketball season opener. 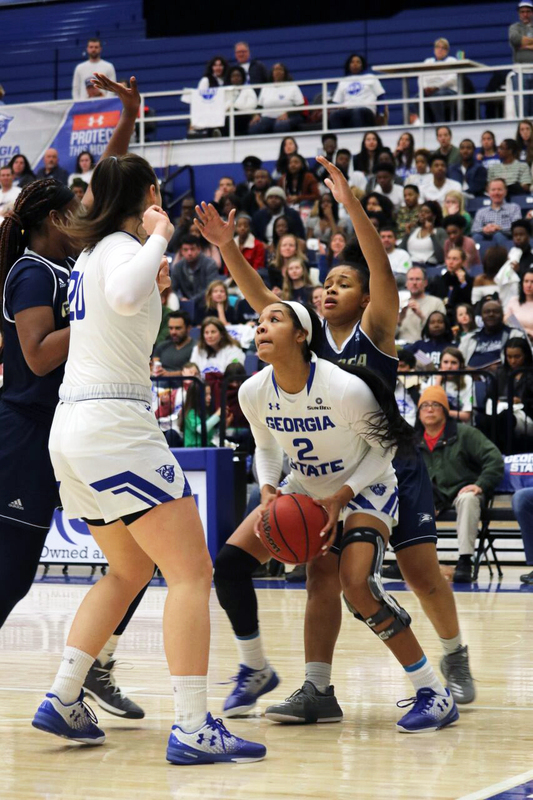 Georgia State (1-0) was led by a strong performance from redshirt graduate transfer Walnatia Wright, who recorded a double-double with 15 points and 11 rebounds. UNCG (0-1) jumped out to a quick 7-0 run after Georgia State give up a 3-pointer and blew defensive assignments. “Well, we just wanted to take a deep breath,” Hill said. “I think that we were kind of nervous and a little bit excited. That’s why I just let them play through it there not calling a timeout. Hill’s decision turned out to be a good one because the Panthers were able to make a small run and grab a 16-15 lead at the end of the first quarter. The Panthers started the second quarter on a 14-4 run, yet redshirt sophomore Jada Lewis had not scored up to that point. Shortly after the second quarter’s start, Lewis scored seven points in less than three minutes of action, and the Panthers went into the half with a 43-29 lead. The Spartans came out of the half on fire, 22-5. The Panthers gave up multiple second-chance points and offensive rebounds that helped spark the Spartans’ comeback. Georgia State would find some offense, and both teams went back-and-forth for the rest of the quarter and headed into the fourth tied at 56. In the fourth quarter, the teams traded baskets until Lewis made back-to-back 3-pointers and senior K.K Williams gave the Panthers a 64-59 lead. The Panthers sealed the win with late free throws and moved to 1-0. Williams shot 4-for-7 from beyond the arc, and finished the game with 13 points and four rebounds. Lewis also added 14 points and six assists. The Panthers want to cut down on turnovers and improve on rebounding moving forward. They will return to action this Saturday against Florida Atlantic.